Longevity Insurance- What does it buy you? As mentioned often, retirees are exposed to three major risks: (1) longevity risk, (2) inflation risk and (3) market risk. In many ways these three risks are intertwined and they all lead to the possibility of running out of money and/or significantly reduced standard of living before death, and lower or no residual estate. While there is little debate about the advisability of tackling the longevity risk, there is much debate about why more retirees don’t address it with immediate annuities to protect against outliving their assets. Perhaps, retirees are not acting as irrationally as it appears by not annuitizing (most commonly as an un-indexed immediate annuity). It may be perfectly rational behavior to be unable to commit to annuitization when one factors in: bequest motive, lack of access to assets in an emergency, risk sharing by couples, inflation risk when relying on a fixed income over 25-40 year period, annuity pricing, and counter-party risk). The common assumptions underlying these cases (when applicable) are that a $100 portfolio can be invested at an average annual return of 7.5% with a standard deviation of 7.5%, and inflation is 3%/year. We will analyze each of these cases with and without a longevity insurance option. Let’s assume that you can buy for $5 from original $100 an un-indexed income stream of $4 starting at age 85. (This pricing appears consistent with what is available today in the emerging Longevity Insurance market, and prices should be getting more favorable as competition kicks in.) Monte Carlo simulation was used (1000 runs, I know 10,000 would be a little better, but will not affect conclusions). These can be considered as the base cases. Looking at the median only, one may dismiss immediately the annuity, as it not only has zero estate value at all ages, but it also provides a lower income stream than the remaining case medians. But the median graphs don’t tell the whole story. The constant $4.5 annual real income stream has a significant probability of running out of money well before age 100 (the 1-percentile curve hits zero at age 23). Also the 1-percentile curve (i.e. the worse 1% of the outcomes), is significantly lower than the annuity income stream. While this may seem unorthodox, I have included a longevity insurance option even for the case of the annuity. You may ask “Why bother since the annuity already has a guaranteed income stream for life?” However, over a 40 year period the real buying power of an un-indexed income is eroded by about 70%, and for a small reduction (5%) in the original annuity of $5.90/year to $5.60/year, starting at age 85 you get a fair level of reduction in the impact of ravages of inflation. Here again, since we are drawing (a constant) 4.7% but a variable dollar value from there is no chance of running out of assts/income. Therefore, one may argue that there is no compelling argument for longevity insurance. Nevertheless, if you look at the 1-percentile curves associated with no Longevity Insurance (LI) curves, you may want to buy protection (insurance) against the low probability occurrence of significant erosion in real draw over age 85. You’ll note that the inclusion of longevity insurance also helps significantly with improving the value of the estate. All this comes at a very small reduction in annual income before age 85. This is the auto-pilot case that is often discussed in decumulation papers and software, whereby you attempt to draw an inflation indexed (constant real value) from your portfolio. I have added an extra graph to show probability of failure in this approach, with a failure defined as being unable to draw the indexed $4.5 at some particular age. 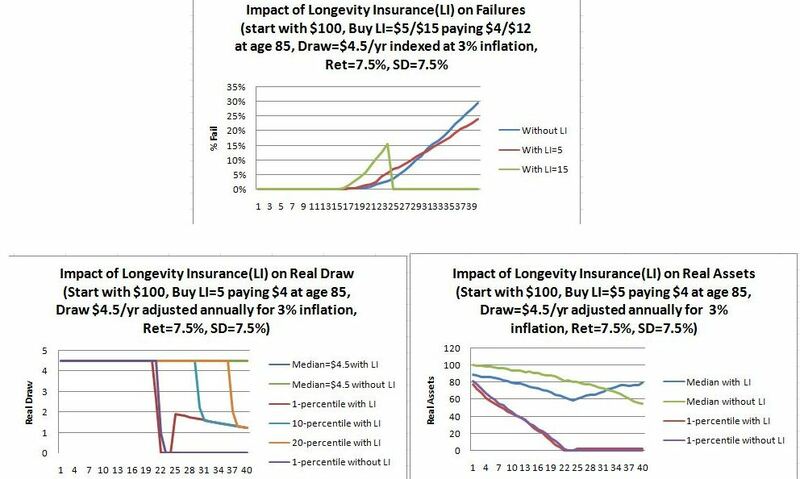 In the failure probability chart, I have also included the effect of buying a higher Longevity Insurance of LI=$15 paying $12/yr starting at age 85. You’ll note that this would increase the failure rate in years 16-24 (because we start with $85 rather than $100 in the no LI instance), however effectively eliminate failures after age 85 (because the $12 payments starting at 85 were sufficient to pay out the required draw and accumulate additional assets to allow payments to continue to age 100). One may not wish to tolerate a failure rate >10% in the early 80s, but it is unrealistic to assume that anyone would start a plan at age 60 and put it on auto-pilot without responding to significant changes in circumstances. You will also not that in the Real Assets chart the residual estate is zero/close-to-zero without/with LI at year 22 (age 82). 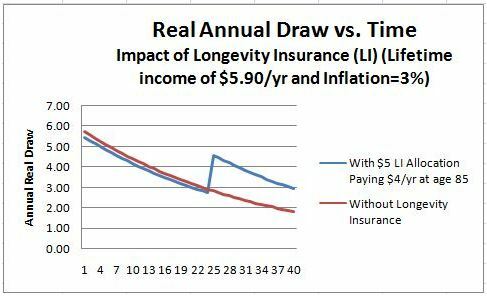 Not surprisingly, the without LI Real Draw chart also shows trouble on the 1-percentile curve at age 82, however with LI=$5 at age 85 you can still see the impact of Longevity Insurance. The 10- and 20-percentile curves were also included to give you a feeling for the probability and impact of failure with and without LI. For my money I would go with “Case #2-the 4.7% draw based on portfolio’s last year end value” with longevity insurance LI=$5. This provides maximum flexibility on adjusting the draw over time if necessary, offers adequate real income and estate protection against all but the absolute worst case outcomes and (what we didn’t even consider in any of these graphs) a 50% probability to outperform significantly on the upside! (The upside is even greater with a more aggressive portfolio, without significantly increasing the downside risk.) Case #2 with Longevity Insurance also addresses retirees’ annuitization and other concerns: access to capital in case of emergencies, some inflation protection (>85), counterparty risk with annuities, and market risk. The following charts compare the three decumulation strategies with and without Longevity Insurance.